With the Super Bowl just around the corner, it's time to start planning your game day menu -- because we all know that the game day food is just as important as the game itself! If you want to impress your friends and family, why not make a fun and easy snackadium as the centerpiece of your game day feast? Red Gold recently sent me a selection of their delicious salsas and diced tomatoes with peppers to create a snackadium for their #RedGoldGameDay blogger contest. If you've never heard of a snackadium, it's basically game day snacks assembled to resemble a football stadium. Snackadiums can be large and very elaborate. I have to admit that seeing pictures of these large snackadiums online was a bit intimidating. I set out to create a simple snackadium that anyone can pull together the morning of the big game! 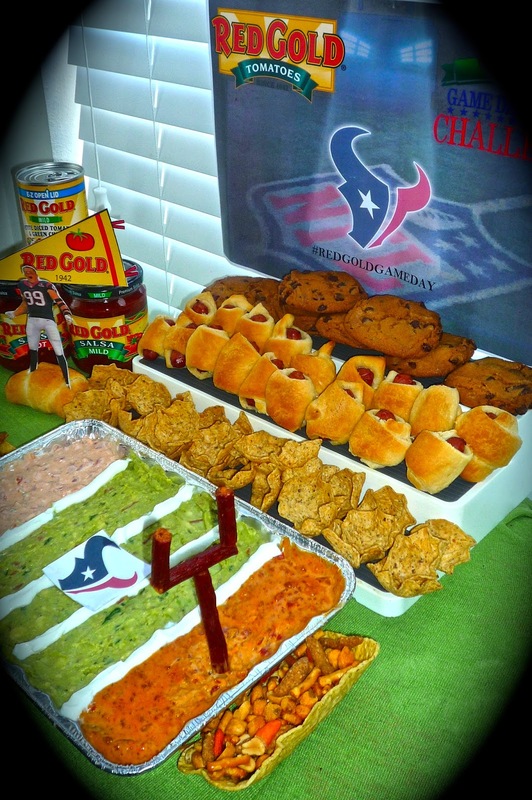 We're huge Houston Texans fans, so that was the decorative theme for my snackadium. Feel free to use decor for your favorite team instead. Once you gather all of your materials, it's time to figure out what snacks to serve before you start assembling. For my football field, I selected a trio of dips featuring Red Gold products. The field is homemade guacamole, and the yard lines are sour cream piped on top of the guacamole. The end zones are a duo of easy-to-make dips. One end zone was cream cheese combined with Red Gold spicy chipotle diced tomatoes and sliced green onion. 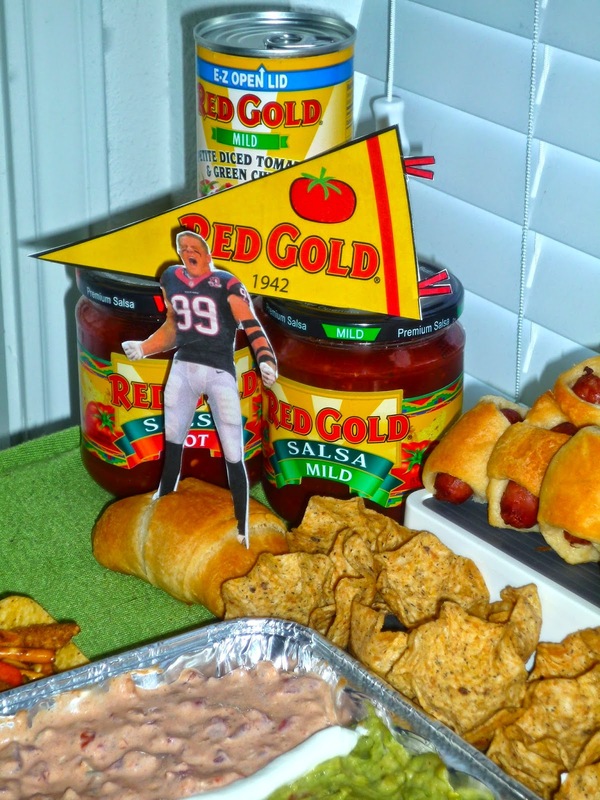 The other end zone was queso dip flavored with Red Gold medium salsa and cooked Mexican chorizo. To complete the field, I made goal posts using beef stick snacks held together with toothpicks. Hint: to ensure they don't collapse, attach the base of each one to a cube of firm cheese with a toothpick before you add the dip to the end zones. To complete my field, I placed a Texans logo midfield. I then placed the Fiesta Flats taco shells to the immediate left and right of the field to resemble end zone seats. I filled the taco shells with a spicy snack mix. For the main snacks, I arranged scoop-shaped tortilla chips on the bottom tier of the three-tier spice shelf. The second tier featured pigs in a blanket sat upright to look like fans in the stand. Because I wanted to include one sweet treat, I placed freshly baked chocolate chip cookies on the top tier of the stands. 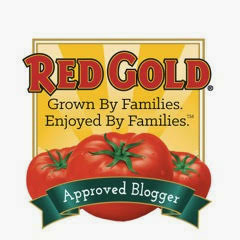 To complete the scene, I arranged a Red Gold banner on a pyramid of their tomato products to the side of my snackadium. Finally, I also added a cutout of popular Texans player JJ Watt. I printed a picture of JJ, attached it to thin card stock with glue stick, and cut it out. I anchored the cutout on a full-size croissant. 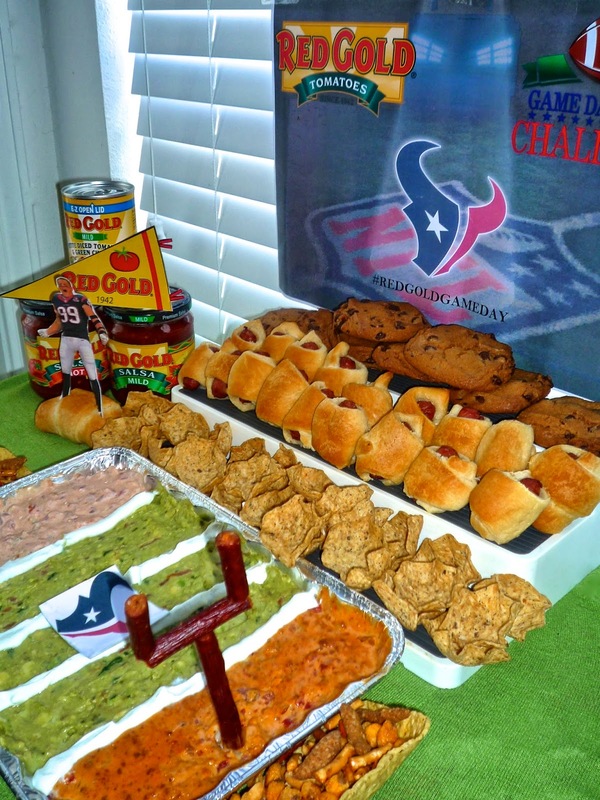 The JJ Watt cutout was the perfect finishing touch for my Texans-themed snackadium! Now that you see how very easy it is to assemble a simple snackadium, I hope that you'll give it a try for your upcoming Super Bowl celebration! 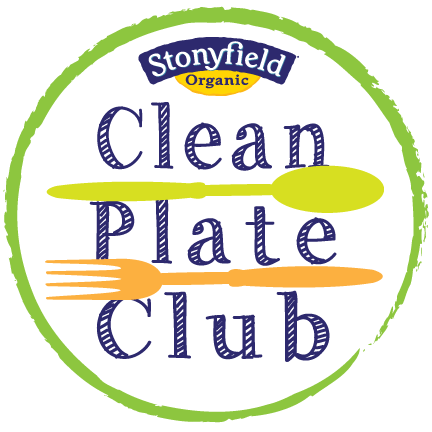 Even if your team isn't playing in the big game this year, you can still have a great time eating some yummy food while watching football and enjoying all of the fun commercials. If you want to take part in the Red Gold Game Day Recipe Challenge, simply follow the instructions in the illustration below! 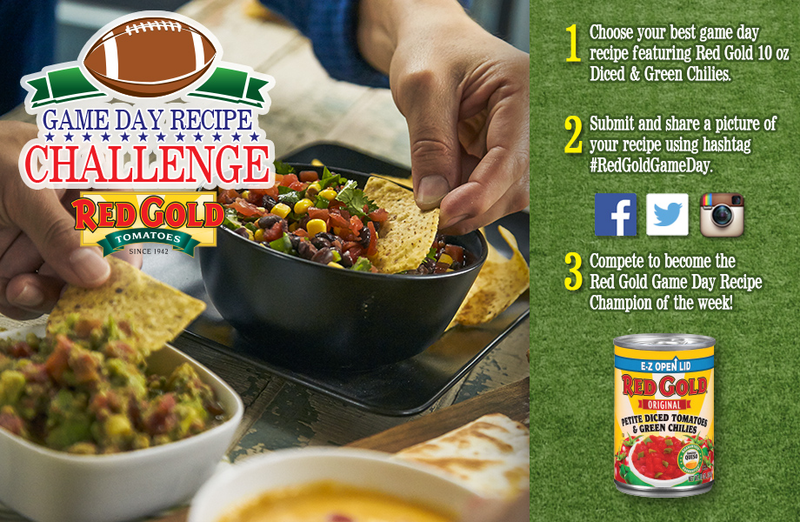 Who knows...your best game day recipe featuring Red Gold tomato products could be selected as the Red Gold Game Day Recipe Champion of the week! What foods do you enjoy on game day? 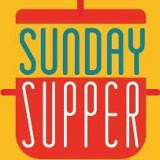 Leave me a comment below letting me know your favorite game day snacks that I should consider adding to my Super Bowl menu. Disclosure: Red Gold provided me with a selection of their salsas and diced tomatoes with chiles, along with a gift card to purchase materials for my snackadium.